Abraham Ancer chips onto the second green during the third round of the Dell Technologies Championship golf tournament at TPC Boston in Norton, Mass., on Sunday. NORTON, Mass. 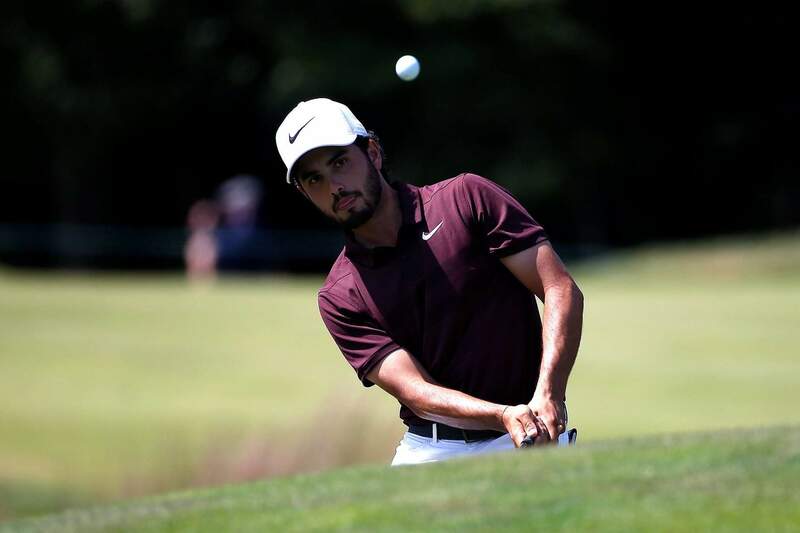 – Abraham Ancer of Mexico opened with three straight birdies on his way to a 6-under 65 to take a one-shot lead Sunday over a familiar figure going into the final round of the Dell Technologies Championship. It wasn’t Tiger Woods, but the guy playing with him – Bryson DeChambeau, who is coming off a four-shot victory in the first FedEx Cup playoff event and shot 63 while playing with Woods for the first time in a tournament. Even with 18 holes left, that’s a long way off. Ten players were within four shots of the lead, a group that included Justin Rose, Rory McIlroy and Jordan Spieth. On another gorgeous day that allowed for good scoring, Spieth didn’t make a birdie until the seventh hole, dropped two shots on the tough stretch of the back nine, answered with two birdies and at least gave himself a chance. Spieth has yet to win this year, and with two events left, still has not secured a spot in the Tour Championship.